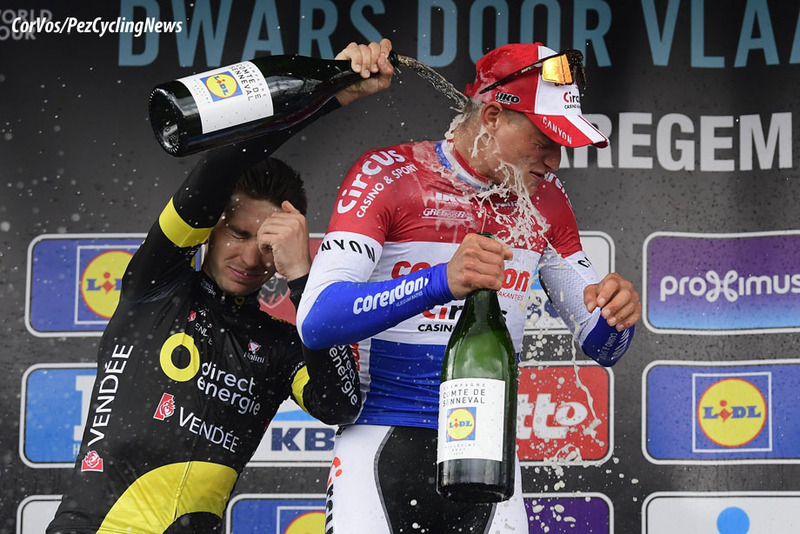 PezCycling News - What's Cool In Road Cycling : Dwars door Vlaanderen’19: Magical Mathieu! 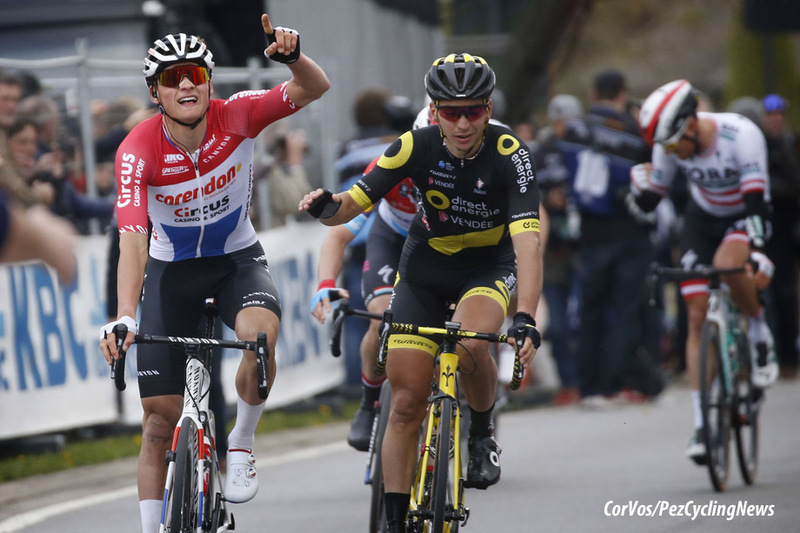 Dwars door Vlaanderen’19: Magical Mathieu! 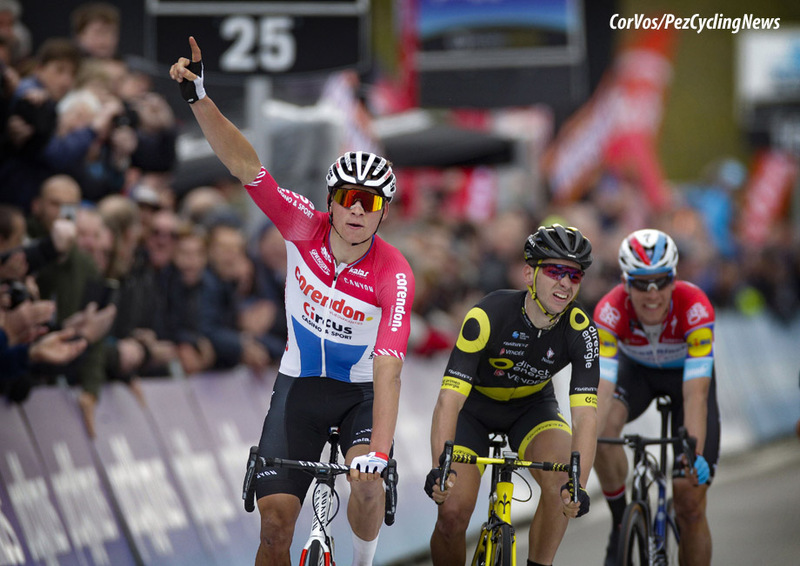 Race Report: Mathieu van der Poel (Corendon-Circus) has won his first WorldTour event, getting the better of Anthony Turgis (Direct Energie) in the sprint at the end of the 74th Dwars door Vlaanderen. 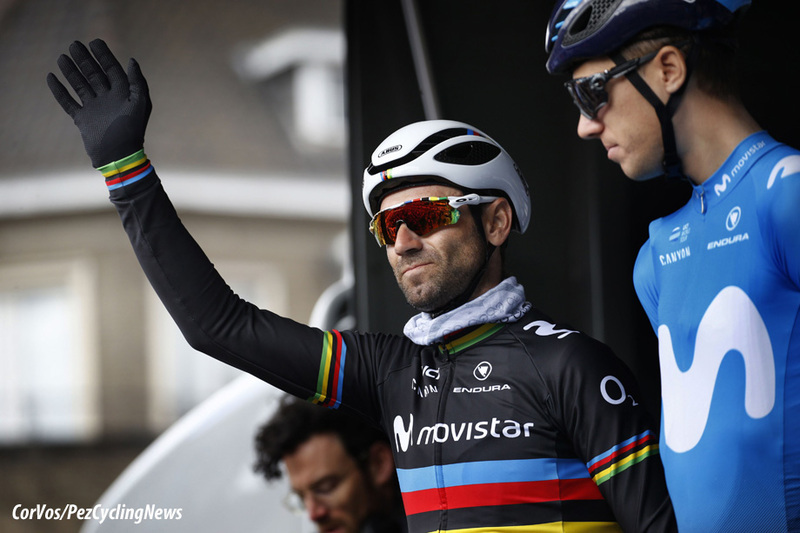 In Waregem he out-sprint a leading group, which had formed in the finalé. 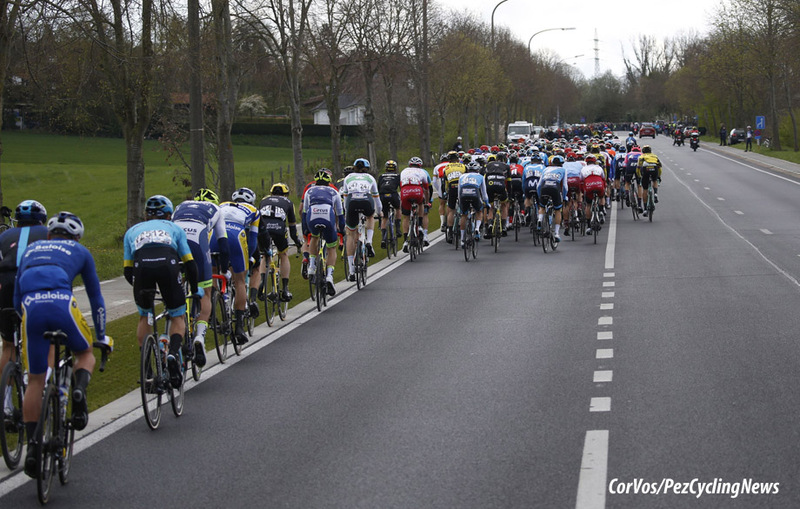 The Dwars door Vlaanderen, at a length of 182 kilometers, is a little on the short side for a Spring Classic, but is always a hard day in Flanders. 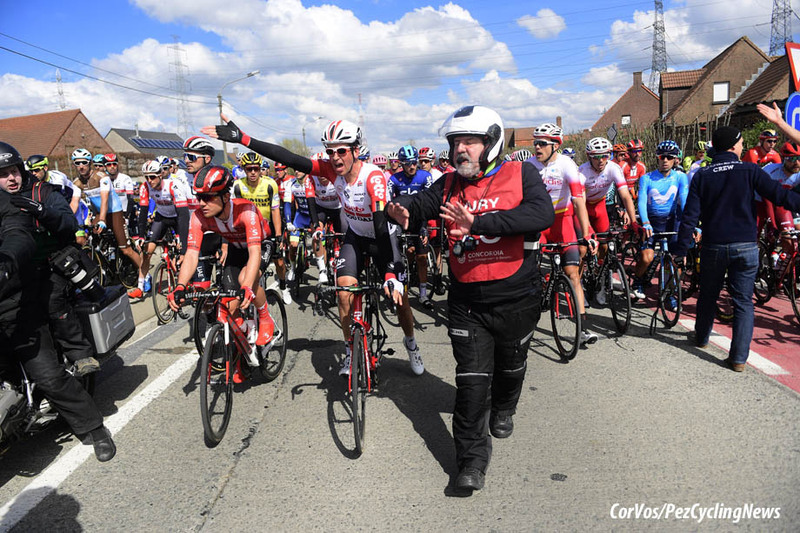 The first climb of the day, the New Kwaremont, comes after 80 kilometers, and from then on the roads get narrower and the peloton more nervous as the climbs come one after the other in rapid succession. Only the tough can survive on this finalé. 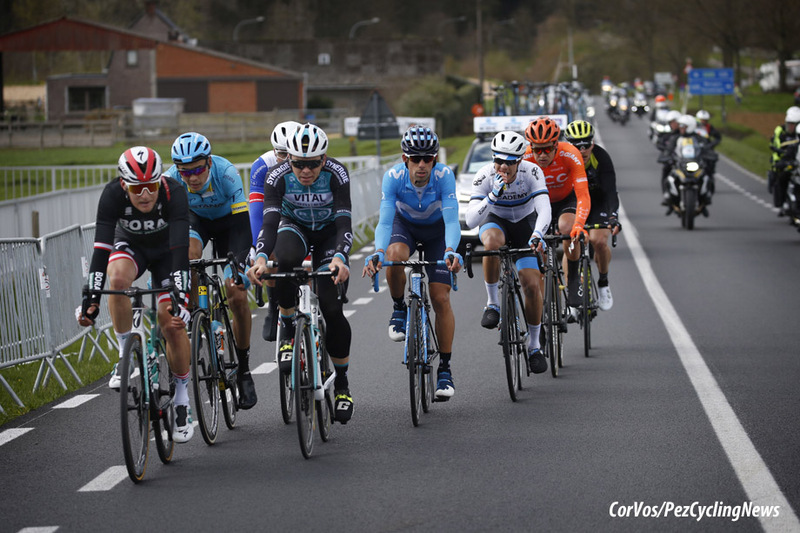 The men's 2019 Dwars door Vlaanderen took an hour until the first successful escape took shape. 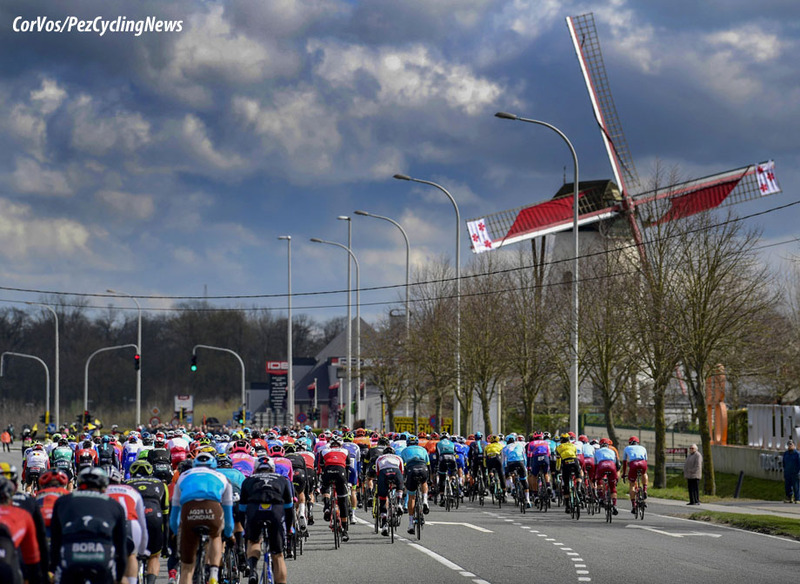 Eight riders made up the early break: Jonas Koch (CCC), Nelson Oliveira (Movistar), Ramon Sinkeldam (Groupama-FDJ), Zhandos Bizhigitov (Astana), Lukas Pöstlberger (Bora-Hansgrohe), Michael Hepburn (Mitchelton-Scott), Kris Boeckmans (Vital Concept-B&B Hotel) and Mihkel Raim (Israel Cycling Academy). 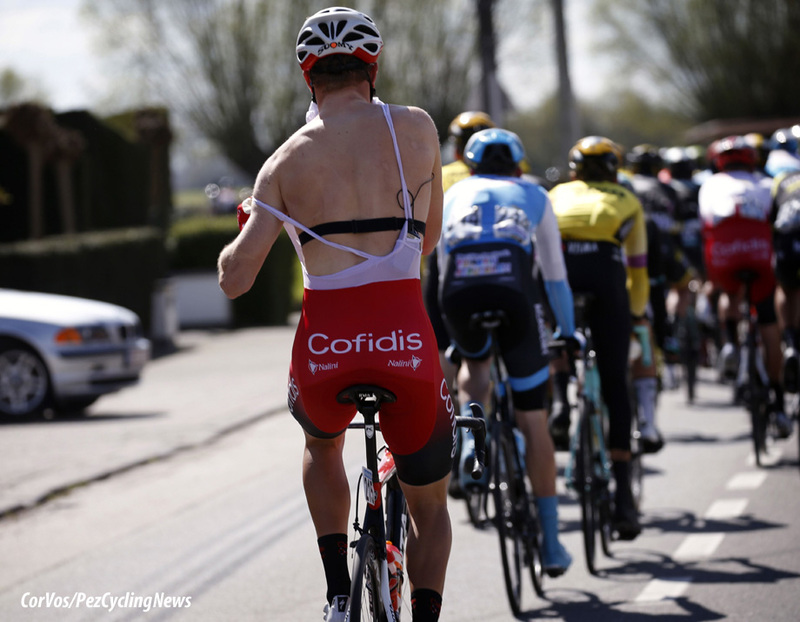 The peloton did not show much interest, allowing the front riders to take a 3 minute lead. 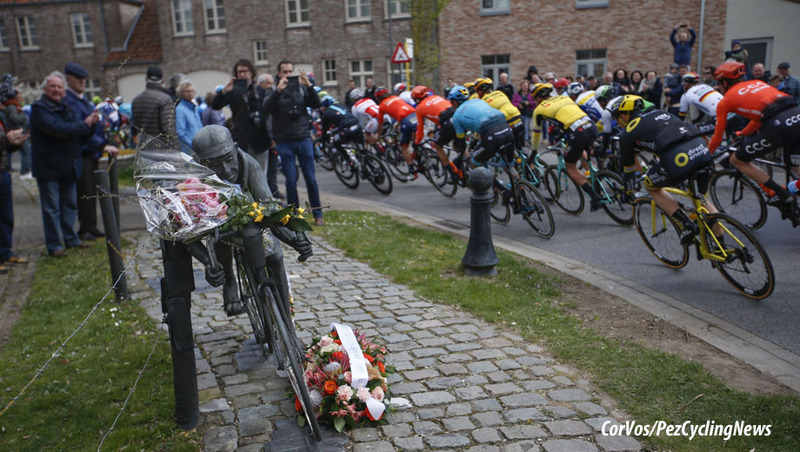 When the first climb of the day came into view, the Nieuwe Kwaremont, the pace went up and the time difference came down. In the run-up to the second climb, the Kluisberg, the race had to stop for a short time due to the women's race. The men had to stop for a while, but they eventually resumed their battle, after some angry words. 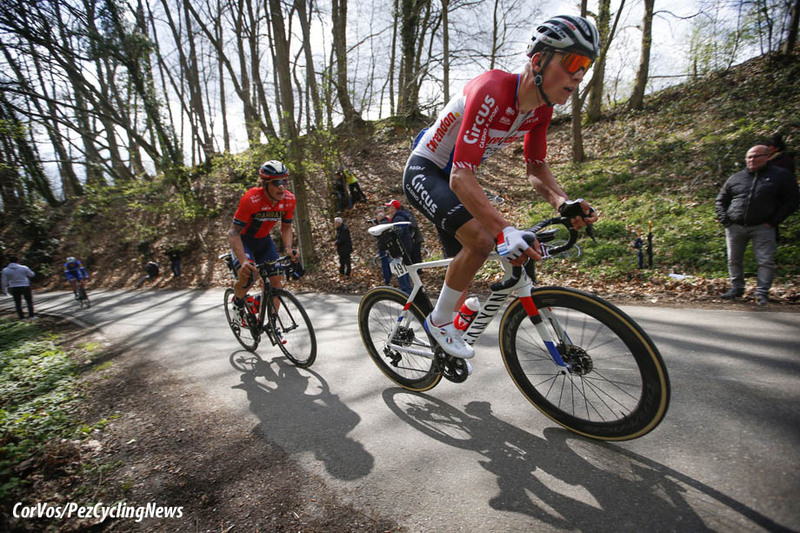 On the Knokteberg, over 60 kilometers from the finish, Mathieu van der Poel attacked. 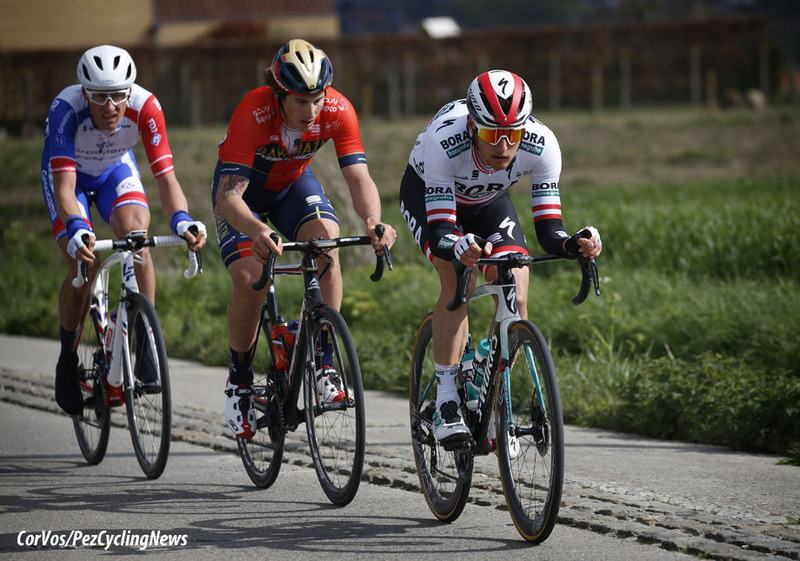 The Dutch champion was joined by Anthony Turgis and Iván García (Bahrain-Merida) and also teammate Dries De Bondt and Kasper Asgreen (Deceuninck - Quick-Step). 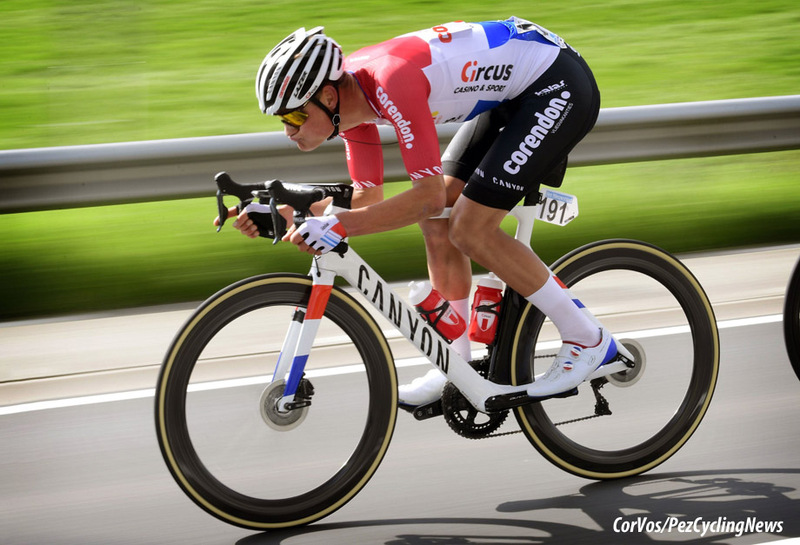 On the run-up to the second passage of the Knokteberg, Van der Poel, Turgis and García joined the leading group, Oliveira had already escaped. At this point the differences was still only small. On the Knokteberg; Pöstlberger joined Oliveira, while the Van der Poel group was within reach of the peloton. 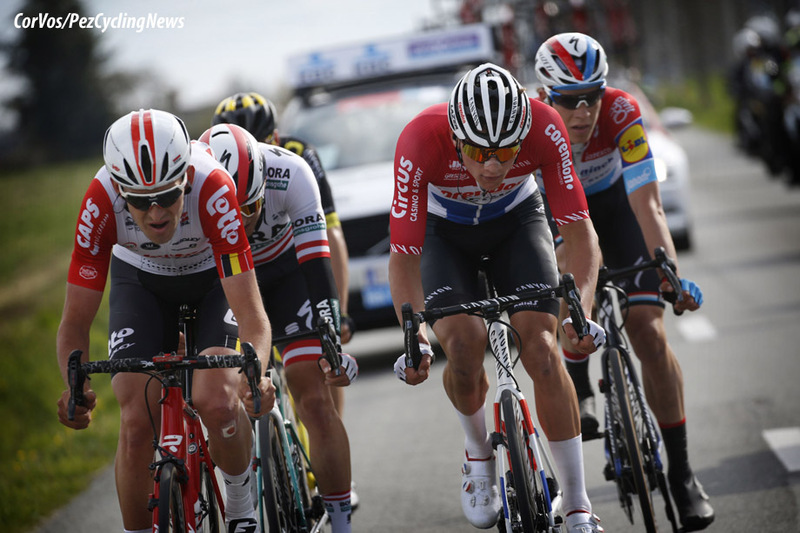 Tiesj Benoot (Lotto Soudal) and Bob Jungels (Deceuninck - Quick-Step) made the crossing to Van der Poel and Turgis. 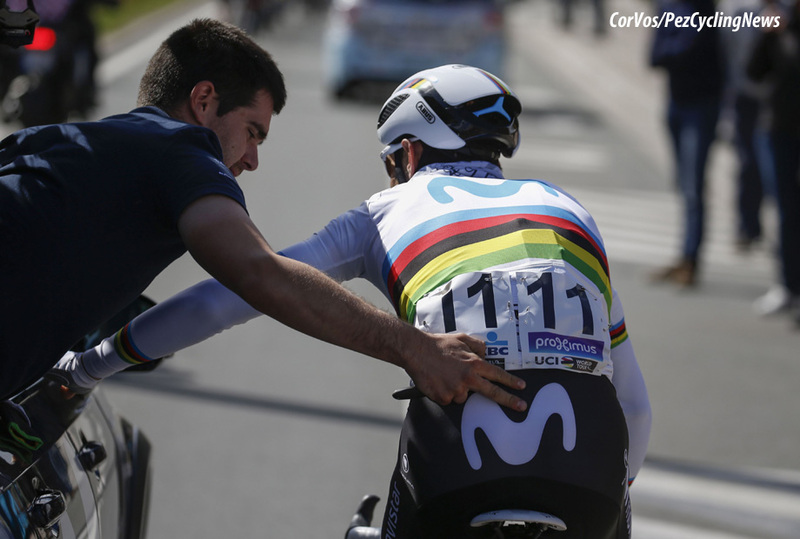 Due to a puncture Oliveira lost his place at the front which left a leading group of five riders up front: Pöstlberger was joined by Van der Poel, Turgis, Benoot and Jungels. 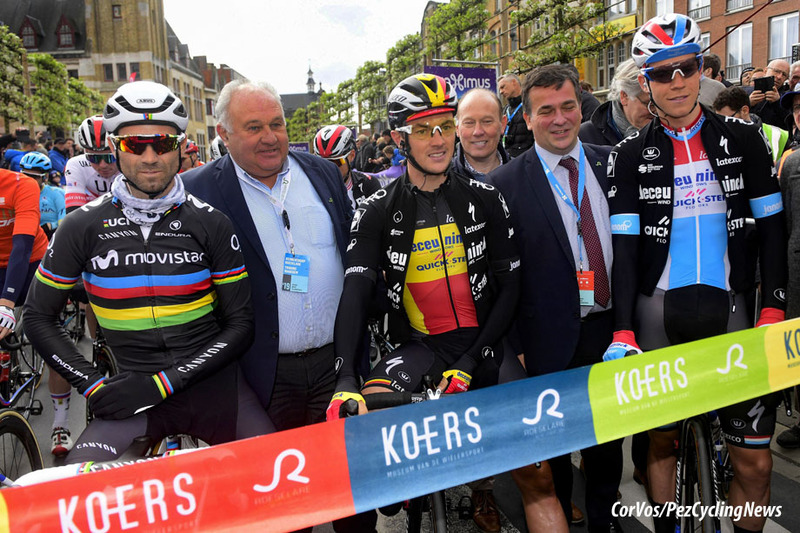 These five riders managed to keep out of the grasp of the peloton, and so the victory would come from one of these men. Despite a few attacks, the race ended in a group sprint. Turgis jumped first, but the National champion of Holland, Mathieu van der Poel, was able to react and had the speed to pass the Frenchman. Van der Poel took the victory in only his second WorldTour race. Turgis had to be happy with second place remained and Jungels third. 25. Jack Bauer (NZ) Mitchelton-Scott.